This article is about the independent King Edward VI school. It is not to be confused with Shrewsbury High School or Shrewsbury Academy. Shrewsbury School is an English co-educational independent school for pupils aged 13 to 18 in Shrewsbury, Shropshire, founded by Edward VI in 1552 by Royal Charter. The present campus, to which the school moved in 1882, is on the banks of the River Severn. The school's old boys – or "Old Salopians" – include naturalists, poets, academics, politicians, authors, sportsmen, actors, and military figures. Following a petition in 1542 to Henry VIII from the townspeople of Shrewsbury for a free grammar school, Shrewsbury School was founded by charter in 1552 under King Edward VI by Adam Jones in three rented wooden buildings, which included Riggs Hall, built in 1450, and now the only remaining part of the original foundation. Originally, the curriculum was based on Continental Calvinism, under its first headmaster, Thomas Ashton (appointed 1561) and boys were taught the catechism of Calvin. The school attracted large numbers of pupils from Protestant families in Shrewsbury, Shropshire and North Wales, with 266 boys on its roll at the end of 1562. It had few facilities so early pupils lodged with local families. 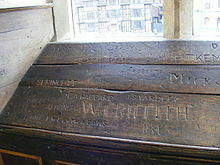 Philip Sidney, who attended Shrewsbury between the ages of nine and thirteen, lodged with the family of George Leigh, Member of Parliament for Shrewsbury. Having achieved a reputation for excellence under Ashton, in 1571 the school was augmented by Queen Elizabeth I. 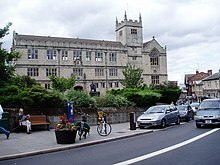 Although Ashton had resigned from his headmastership in 1568, he returned to Shrewsbury in 1578 to help draw up the ordinances governing the school, which were in force until 1798; under them, the borough bailiffs (mayors after 1638) had power to appoint masters, with Ashton's old St John's College, Cambridge having an academic veto. Shrewsbury has retained links with the College, with the continued appointment of Johnian academics to the Governing Body, and the historic awarding of 'closed' Shrewsbury Exhibitions. The stone buildings on Castle Gates, including a chapel, dormitories, library and classrooms were completed by 1630 and the school continued in these, until it was relocated in 1882. Subsequently, the premises were converted to a public Free Library and Museum by the Shrewsbury Borough Council, opening in their new role in 1885. In the 20th century the library purpose gradually took over the building. After a period of structural deterioration, followed by extensive restoration work, the buildings were re-opened entirely as Shrewsbury Public Library in 1983. The reputation of the school declined in the following centuries. Samuel Butler became headmaster in 1798. The school had just three headmasters during the 19th century. Butler was succeeded by his pupil Benjamin Hall Kennedy (of Latin Primer fame) in 1836, who in turn gave way to Henry Whitehead Moss in 1866. Under Butler and Kennedy, Shrewsbury was one of three provincial schools among the nine studied by the Clarendon Commission of 1861–64. In 1882, Moss moved the school from its original town centre location to a new site of 150 acres (61 ha) in Kingsland, on the south bank of the River Severn overlooking the town. A legacy of this move can be seen in the school campus being referred to as "The Site". The school was set up in a building that had at different times housed a foundling hospital and the Shrewsbury workhouse; buildings have since grown up around the edge of the campus with sports pitches in the centre. Moss was succeeded in 1908 by Cyril Alington, then Master in College at Eton. Alington, though a Fellow of All Souls College, Oxford, was a sportsman, evidenced by the 1914 appointment as his secretary of Neville Cardus, the future cricket journalist who had joined the school in 1912 as the school's assistant cricket professional. At the time of his appointment as Headmaster, Alington was younger than any of the masters on the staff, so to bring in new blood into the teaching staff, he recruited several former Collegers from Eton, most notably The Rev. Ronald Knox [See 'Ronald Knox' by Evelyn Waugh 1959 & 'The History of Shrewsbury School' by J.B.Oldham, 1952]. Alington revived attendance which had fallen away under Moss, and he was an energetic builder; the school hall is named after him. Since the turn of the millennium, the school's site has seen investment. A new music school, The Maidment Building, was opened by Prince Charles in 2001. The Main School Building - originally an institutional building of 1765, remodeled by Sir Arthur Blomfield (whose other educational commissions include Lady Margaret Hall, Oxford University and Marlborough College) - saw renovation over several years, modernising all classrooms in the mid to late 2000s. A new boarding house has been completed, as has a new world-class indoor cricket centre and a new swimming pool. In 2003 Shrewsbury International School, Bangkok was opened in Bangkok, Thailand, on the banks of the Chao Phraya River. In 2005 Shrewsbury School was one of fifty of the country's leading independent schools which were found guilty of running an illegal price-fixing cartel which had allowed them to drive up fees for thousands of parents. Each school was required to pay a nominal penalty of £10,000 and all agreed to make ex-gratia payments totalling three million pounds into a trust designed to benefit pupils who attended the schools during the period in respect of which fee information was shared. Jean Scott, the head of the Independent Schools Council, said that independent schools had always been exempt from anti-cartel rules applied to business, were following a long-established procedure in sharing the information with each other, and that they were unaware of the change to the law (on which they had not been consulted). The main sport in the Michaelmas (autumn) term is football, in the Lent term fives and rugby, and in summer cricket. Rowing is another main sport which happens all year, and the Royal Shrewsbury School Boat Club (RSSBC) is one of the oldest school rowing clubs, having been founded in 1866. Since the boat club began rowing at Henley Royal Regatta in 1912, they have won 14 times, which is second only to Eton. Admission of girls in 2014 has seen the introduction of field hockey, netball and lacrosse, with cricket and tennis played during the summer term. Shrewsbury School viewed from The Quarry, with the school's boathouse in the foreground. The Royal Shrewsbury School Hunt (RSSH or "the Hunt") is the oldest cross-country club in the world, with written records (the Hound Books) going back to 1831 and evidence that it was established by 1819. The sport of "the Hunt" or "the Hounds", now known as a Paper Chase, was formalised at the school around 1800. Two runners (the "foxes") made a trail with paper shreds and after a set time they would be pursued by the other runners (the "hounds"). The club officers are the Huntsman and Senior and Junior Whips. The hounds start most races paired into "couples" as in real fox hunting; the winner of a race is said to "kill". In his 1903 semi-autobiographical novel The Way of All Flesh, Old Salopian Samuel Butler describes a school based on Shrewsbury where the main protagonist's favourite recreation is running with "the Hounds" so "a run of six or seven miles across country was no more than he was used to". The first definite record of the Annual Steeplechase is in 1834, making it the oldest cross-country race of the modern era. The main inter-house cross-country races are still called the Junior and Senior Paperchase, although no paper is dropped and urban development means the historical course can no longer be followed. Every October the whole school participates in a 3.5 mile run called "The Tucks", originally intended to prevent pupils attending a local horse race. The school also lays claim to the oldest track and field meeting still in existence, which originated in the Second Spring Meeting first documented in 1840. This featured a series of mock horse races including the Derby Stakes, the Hurdle Race, the Trial Stakes and a programme of throwing and jumping events, with runners being entered by "owners" and named as though they were horses. Shrewsbury is one of only two public schools to have bumps races, the other being Eton, between the houses. They are rowed over four evenings at the end of term in July. There are usually three boats entered per house. On the fourth evening there are prizes for the leaders of the chart and the Leadbitter Cup for the boat which has made the most bumps over the four nights. The event is marshalled by senior rowers and rowing prefects, usually masters. The crew training is mainly pupil driven, though in preparation for Henley the school's First VIII rowers often do not take part, and therefore the boats are composed of other rowers and some non-rowers. Previously, races were run every day until there were no more bumps (i.e. until they were nominally in speed order). This historical set-up could lead to weeks of racing and it was therefore abandoned in favour of a four-day version more than 100 years ago. Otherwise, it is only Oxford and Cambridge that continue to have bumps. Shrewsbury and Eton both race bumps in fours whilst Oxford and Cambridge race in eights. The school's original Castle Gates premises had little in way of provision for games. Under Dr Butler, there were two bat[clarification needed] fives courts and playgrounds in front of and behind the buildings, but after the arrival of Dr Kennedy football was permitted, for which the school acquired a ground in Coton Hill (north of Castle Gates). The present school buildings in Kingsland are arranged around the sports fields which have nine grass football pitches and one of Astroturf; almost all boys play football in the Michaelmas term. Salopians were prominent in the early history of the organised game at Cambridge University, according to Adrian Harvey "Salopians formed a club of their own in the late 1830s/early 1840s but that was presumably absorbed by the Cambridge University Football Club that they were so influential in creating in 1846". The school has an 1856 copy of the Cambridge rules of football, predating the 1863 rules of the FA. Benjamin Hall Kennedy, headmaster of Shrewsbury for thirty years, from 1836 to 1866. The Arms of the school are those of King Edward VI being The Arms of England (three lions passant) quartered with those of France (fleur-de-lys). Former pupils are referred to as Old Salopians (from the old name for Shropshire). Twm Morys (born 1961), poet and musician. Two Old Salopians received the Victoria Cross, both in the First World War, 1914–18. ^ Oxford Dictionary of National Biography, Volume 2. Oxford University Press. 2004. p. 684. ISBN 0-19-861352-0. Article on Thomas Ashton by Martin R. Speight. ^ Oxford Dictionary of National Biography, Volume 2. pp. 684–685. ^ "Governing Body Members' Details". Shrewsbury School. Retrieved 4 May 2018. ^ Beryl Copsey (April 1985). Read All About It! Grand Opening of Shrewsbury's free library 100 years ago. The Shropshire Magazine. p. 18–19. ^ A plaque erected by The Rotary Club of Shrewsbury, commemorating the club's 60th anniversary in 1985, reads: Castle Gates Library erected by Edward VI in 1552, Shrewsbury School occupied this site until 1882. The stone buildings were built 1594–1630. Judge Jefferys and Charles Darwin were educated here. Re-opened as a library in 1983 after complete renovation. ^ a b Lee, Sidney (1886). "Butler, Samuel (1774-1839)" . In Stephen, Leslie (ed.). Dictionary of National Biography. 8. London: Smith, Elder & Co.
^ Stray, Christopher (2005) Histories of the Nine Clarendon Schools: v. 1 Thoemmes Continuum ISBN 1-84371-108-7, ISBN 978-1-84371-108-7. ^ "Shrewsbury School". TES. Retrieved 21 April 2011. ^ a b c Robinson, Roger (December 1998). "On the Scent of History". Running Times: 28. ^ Butler, Samuel (1903). "39". The Way of All Flesh. Project Gutenberg. ^ "The Tucks". Shrewsbury School. 2011. ^ "Football". Shrewsbury School. 2011. ^ Harvey, Adrian (2005). Football: The first hundred years. Routledge. p. 251. ^ "Shrewsbury School coat of arms", The Victorian Web. ^ 'Frank McEachran', obituary in Books and Bookmen, vol. 20 (Hanson Books, 1975), pp. 58–59.